In Martin Luther King, Jr.’s time, visual aids weren’t just a luxury - they were an hassle, and in some cases, an impossibility. Thanks to technological advances today, you have projectors in almost every main hall of a speaking event, or a white board with markers at the very least. As such, it’s no excuse to not have visual aids accompanying your speech. Why are visual aids so important? They stimulate another one of your audience’s senses and forces their brain to link the two together. This inadvertently helps keep them awake and focused throughout your speech. Most importantly, they allow you to further reinforce your points to your audience, and increase the number of associations their brain makes which can heighten your audience’s recall of your topic. Let me share with you two very commonly used, and highly effective, visual aids that will captivate your audience’s attention and help cue you as your speak. Firstly, flip charts. Flip charts are huge pads of paper that are mounted on a portable easel. This visual aid is best used with a relatively small audience - typically 20 or fewer - unless there’s a camera to magnify the chart for the rest of the hall. You can use bold or dark colors against a white flip chart to increase the ease of reading. A flip chart can be prepared prior to your presentation, but the power of the flip chart is that it can be used for drawing or writing during your presentation. Many motivational speakers adopt the flip chart, why? 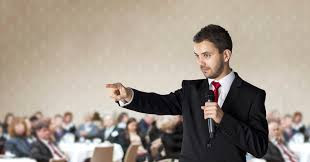 Because in comparison with powerpoint presentations, a flip chart allows the presenter to have a wider range of body movement in order to reinforce and reiterate their points with gestures and force. Next up, you’ve got the powerpoint presentation. These days using a laptop, a projector and Microsoft PowerPoint or the Apple Keynote program is the norm. Technological advances have allowed us to produce dramatic, high-resolution visual aids such as animation and simulations. Today, computer-based visual aids are becoming the standard for many technical, educational and even business-related presentations. The power of the powerpoint presentation is that it can be used for both small and large audiences and can convey both simple and highly complex information. Today, with remote control devices, you can even change your visuals as you walk about the stage. If you’ve ever watched TED videos online, or attended a TED Talk, you’ll know what I mean. The challenge with computer-based visuals is that you need to keep them simple. There are many things to consider when crafting your presentation. Here are a few you can keep in mind. Firstly, your font. Not only is font-size important, your choice of font affects readability significantly. Always stick to high readability fonts such as “Times New Roman”, “Arial” or “Helvetica”. San-serif fonts are preferred as they usually increase readability. If these fonts seem “boring” or “distasteful” to you, scrap that thought. Your audience will thank you profusely for using these fonts. Secondly, your colors. Choose colors that heighten readability. Remember that red text against a black background is a terror to read, and the same for vice-versa. Stick to pale, pastel backgrounds and dark text color such as black, or dark, black/brown backgrounds and white text color. And remember that your text should only have a maximum of three colors. If you fear that your presentation has become too monotone, you can always opt for colorful images and pictures to add a splash of life to your slideshow. But remember to choose your pictures wisely and to not let them upstage you and your speech. Thirdly, K.I.S.S. Yes, keep it simple and suggestive. I’m talking about the text. It’s a presentation faux pas to read your slides to your audience. You should know everything inside out and only occasionally turn to your slides for a cue or reference. Most importantly, the main points of your presentation should not be in your visual aids. The text in your visual aids should only allude to your main points. Use bullet points instead of full sentences in order to decrease the wordiness of your visual aid. This also applies for your charts and diagrams. Don’t present them a full-fledged chart with 20 components to decipher. If your presentation requires charts and graphs, slice the data for your audience beforehand. They don’t need to know everything - only your key findings and the significant statistics. Lastly, less is more. This is in reference to your animation. You can use animation to reiterate a point, or even create some drama and suspense. But to animate every single word or object in your presentation is a huge no-no. Not only will you heavily distract your audience, you may also give them a headache. To quickly summarize, flip charts are great to use with smaller crowds and give you wider range of movement. If you’re considering using powerpoint or keynote slides as a visual aid, remember the 4 rules to increase readability and audience attention: 1. Simple font, 2. High contrast and minimal colors, 3. Keep it simple and suggestive, and 4. less animation is more. Visual aids are huge help for presentations and should be used if possible. However, avoid the number one mistake made by many novice speakers: Do not let your visual aids control you. You control the presentation. Your visual aid, is merely an “aid” and is not the entire show. Use it to reiterate and back up your points and don’t make it the point of the entire presentation. Remember that the point of your visual aid is to motivate your audience and arouse their imagination to help them to empathize with your idea and topic and visualize it far beyond what is visible in the ephemeral PowerPoint slide they currently view.